How Much Money Would an Earth-Like Exoplanet Really Be Worth to Us? The prospect of finding another planet like Earth is exciting from the perspective of exploration — and our future as a species. But let's consider the bottom line. What would such a discovery really be worth for us in terms of money? Astronomy journalist Lee Billings breaks it down for you. Billings' book Five Billion Years of Solitude has just come out in paperback, and we're celebrating with this excerpt on the people who are figuring out just how much money we'd make on an Earthlike exoplanet. Back in 2009, less than a week after a Delta II rocket launched NASA's Kepler space telescope into planet-hunting history, the University of California, Santa Cruz astrophysicist Greg Laughlin had quietly posted a strange, half-whimsical equation on his blog systemic, at oklo.org. In a series of subsequent posts, he explained how the long string of obscure variables and weighted functions could be used to crudely quantify the value of any terrestrial exoplanets that Kepler and the handful of other leading surveys might soon discover. It was, he said, an attempt to judge whether any particular "Earth-like" world was worthy of legitimate scientific excitement, independent of media hype. After plugging in a few key parameters—such as a planet's mass, its estimated temperature, and the age and type of its star—Laughlin's equation would generate a value, in U.S. dollars, that could be assigned to that particular world. Small, rocky worlds in clement orbits around middle-aged, middle-of-the-road stars similar to the Sun merited the highest values, as those planets presumably offered the best chance for harboring complex biospheres that could eventually be detected by future space telescopes. For a planet to be worthy of wide attention, Laughlin opined, it would need to at least break the million-dollar mark. Laughlin drew his economic baselines from simple math, dividing Kepler's federally funded $600 million price tag by 100, a conservative estimate of how many terrestrial planets the space telescope would dis- cover during its lifetime. If such planets could be considered commodities, the math suggested that the 2009 market price, as determined by U.S. taxpayers, could be set at $6 million per world—a value that could drop over time if small rocky planets began to overflow astronomers' coffers. 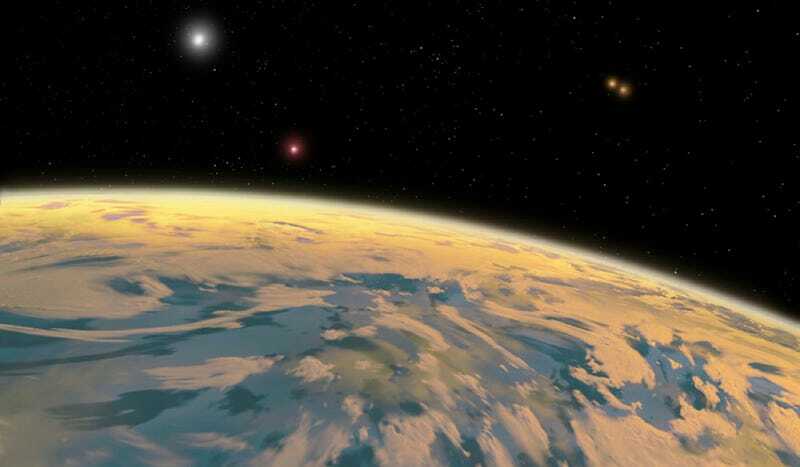 If, however, Kepler found a terrestrial world in the middle of a Sun- like star's habitable zone, Laughlin's test runs suggested such a planet's value could exceed $30 million in his equation. The cleverest part of Laughlin's valuation equation was its treatment of a planet's home star, which allowed his numerical scrutiny to be extended to the worlds in our own solar system. Photons, not dollars, are a planet hunter's fundamental currency, as they are what allow a planet to be not only detected but also subsequently characterized. The more photons astronomers can gather from an exoplanetary system, the more they can learn about it. Stars and planets nearer to our solar system are brighter in our skies due to their close proximity, and hence more valuable, providing floods of useful photons where more distant objects would only offer trickles. This facet was why so many of Kepler's small planets would struggle to reach a valuation of even a million dollars: the Kepler field stars were far away, and thus very dim. The brightest star visible in the solar system by many orders of magnitude is, of course, the Sun, which has the capacity to send local planetary valuations into truly astronomical territory. When he ran his equation for our own planet, Laughlin obtained a value of approximately five quadrillion dollars—roughly one hundred times the global gross domestic product, and, he reckoned, a handy approximation of the economic value of humanity's accumulated technological infrastructure. Laughlin had also run his equation on a purely hypothetical Earth-size planet in the habitable zone of one of the two Sun-like stars in the Alpha Centauri system. He obtained a value of $6.5 billion— coincidentally about the same amount of money astronomers often estimate would be needed to build a space telescope capable of seeking signs of life on such a world. If humans actually voyaged there, Laughlin once pointed out to me, the star would become ever brighter, until it was a new Sun in a new sky of a New World. "So in going there, you have this ability to intrinsically increase value. And that's an exciting thing because it ultimately provides a profit motive for perhaps going out and making a go of it with these planets. This is saying that something that is several billion dollars on Earth could be, if you go there, a quadrillion-dollar payoff." Two years after Laughlin had posted his equation, I found myself in the passenger seat of his car, as he drove us back to Santa Cruz from a science conference just outside of San Francisco. In the back seat sat Taylor Ricketts, a World Wildlife Fund ecologist and expert in "natural capital," the economic benefits of material goods and services provided by Earth's biosphere. Ricketts was part of a growing interdisciplinary push to study ecology in the context of economics, a field interested in not only the monetary value of, for instance, a pristine forest, but how that value might change if the forest was converted to pasture, or a parking lot. Ricketts wanted to talk about Laughlin's equation. At the time, Ricketts was a few months away from becoming director of the University of Vermont's Gund Institute for Ecological Economics, which he mentioned in passing not long after we crossed over the Golden Gate Bridge and began to drive on Highway 101 through downtown San Francisco. Gund's previous director, an ecologist named Robert Costanza, had "gotten into trouble" back in 1997 for a Nature paper in which he tried to estimate the value of the planet, Ricketts said. Laughlin's bushy eyebrows bounced up as he looked back at Ricketts in the rearview mirror. "What was the figure Costanza came up with?" "Thirty-three trillion dollars per year, for all the world's ecosystems." "I don't know why you'd get in trouble for that," Laughlin sighed. "He made several basic economic mistakes that made his final figure essentially unsupportable," Ricketts said. "But more fundamentally, his critics just said, 'Thirty-three trillion dollars is a nice underestimate of infinity.' The value of the planet to us is infinite, because if all the ecosystems go away, life ends. For all of us. So there's not really a valid reason to put a number on that. Some people said he was silly for making his estimate, and others called him brave for trying. It's hard to know how much it has affected his career, but his name is kind of shackled to that paper." Minutes passed. We eased into a snarl of afternoon traffic congested by a red stoplight at the crest of a long, high hill. "So, an interesting counterargument to the 'infinite' value of the Earth is the fact that at some point this will all go away," Laughlin said. His eyes darted to sweep over the pedestrians slowly scaling the steep, tree-lined sidewalk, the cars idling their engines in the street, the people wandering in and out of boxy wooden row houses and tall office buildings of glass and steel, before his gaze finally came to rest back in the rearview. "And not because of anything we're doing, but because the Sun willevolve into a red giant and destroy the Earth. I don't think that's something for which we just have to sit down and acquiesce. So this becomes a question of where we are willing to begin talking about timescales on which our actions could have some conceivable utility." "That's true," Ricketts said. "But economics is about how you make decisions under scarcity, right? You can't do everything, so how do you choose what to do and what not to do? You can't buy everything, so how do you choose what to buy and what not to buy? The reason to put value on things is to inform a choice you might have—that's the fundamental reason for economics to be. To place a value on the Earth . . ." He trailed off for a moment, finding his words. "I don't understand what the option or choice is there, what we would do with that information. It's not like we have the option of not being destroyed by the Sun, and that's probably why economists think a planetary valuation is a bit silly." Laughlin shot a smiling glance my way. "But we do have an option. We can move the Earth." A pregnant pause. "Move the Earth?" "Like, tow it out of the way?" "Essentially, yeah. We have more than enough time. Just take some large comets or asteroids from the Kuiper Belt and use them to tap and transfer some of Jupiter's orbital energy and angular momentum to the Earth over a timescale of hundreds of millions of years. Each time one flew by the Earth, you'd get a small kick, and you'd expand the Earth's orbit very gradually through those repeated close encounters. You'd need on order of a million close passes, one every several thousand years, but you could move the Earth's orbit out, close to where Mars is now. This is an idea I worked out ten years back with a couple of friends." Another pause, as Ricketts pondered Laughlin's outlandish proposal. "That's cool. So it's a cost-benefit analysis: What would it cost us to tow the Earth out of the way, versus what's at stake on the benefit side?" "You might destabilize and lose Earth's Moon," Laughlin said. "And you would have to be extremely careful to properly time each flyby so your object didn't collide with and sterilize the planet down to bacteria. But that intervention could net you billions more years for the biosphere, which is a lot of economic utility, and the cost is very small in comparison, because most of the energy to move the Earth is actually coming from Jupiter, transferred by the comet. You just have to have very subtle control of the comet's trajectory when it's way out at the slow, far point of its orbit in the outer solar system. It's a matter of finesse more than brute force, but it's just rocket science. The point is, we could start doing this practically today, if we wanted." "I'm still hung up on the value being infinite," said Ricketts, sounding skeptical. "It's all life on the planet. We know extinction is worth a lot of money to avoid without needing to quantify just how worthwhile it is." "But there are hierarchies of infinity," I interjected. "Some are greater than others. The value of a commodity increases based on its scarcity, right? We still don't know how common Earth-like planets might be. Not just Earth-size balls of rock, but planets with water, weather, and living things. Maybe they're common out there, and life is cheap. But what if we end up taking the galactic census only to find that around the nearest five hundred or thousand stars there are simply—"
"No Earths," Laughlin finished, nodding. "We'll have to wait and see." Reprinted from FIVE BILLION YEARS OF SOLITUTDE: The Search For Life Among The Stars by Lee Billings with permission of Current, a member of Penguin Group (USA) LLC, A Penguin Random House Company. Copyright (c) Lee Billings, 2013.